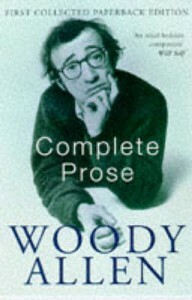 The Complete Prose of Woody Allen is a bumper collection of comic fiction and essays and consists of the three Woody Allen books of humorous prose – Getting Even (1971), Without Feathers (1975), and Side Effects (1980). There are over fifty pieces of comic writing here which makes the book both great value for money (my paperback copy is 473 pages long) and a handy companion to dip into on a train or when you are stuck for something to read. The book is a good example of Allen’s versatility and comic flair and the pieces, mostly written for The New Yorker originally, are very much in the spirit of SJ Perelman and Groucho Marx, absurdist but with a cerebral comic twist courtesy of Allen and plenty of references to history and classic literature. The collection finds the author musing in a not very serious manner about everything from Eschatological Dialectics as a Means of Coping with Shingles to The Cosmos on Five Dollars a Day. I like too Selections from the Allen Notebooks, a highly enjoyable glimpse at the ‘hitherto secret’ diary of Woody Allen – ‘Do I believe in God? I did until my mother’s accident. She fell on some meat loaf and it penetrated her spleen. And how can I believe in God when just last week I got my tongue caught in the roller of an electric typewriter?’ Also worth a look is The UFO Menace where Allen takes a not very serious look at the history of UFO phenomena. I particularly enjoyed the case of a Sir Chester Ramsbottom from Shropshire who, Woody tells us, was tailed by a UFO he could not shake off for some time in 1961. ‘Upon investigation,’ writes Allen. ‘Experts determined that the cigar-shaped object was Sir Chester’s nose. Naturally, all his evasive actions could not lose it, since it was attached to his face.’ The Gossage-Vardebedian Papers is worth a mention too, a very clever and funny exchange of letters between two chess players about a match they are playing through the post which becomes increasingly pedantic and bitter. The Complete Prose of Woody Allen is a hugely enjoyable book crammed with funny lines, aphorisms (‘Eternal nothingness is OK if you’re dressed for it’) and comic ideas. There are literally dozens of essays and pieces here I haven’t even mentioned so the book is a great purchase for any Woody Allen fan who doesn’t own the original books that make up this collection. The pieces are especially interesting too because they were mostly taken from a period in Allen’s life when he seemed on course to become the new SJ Perelman more than anything else. Of course his directing career took off in the meantime and he became much more interested in becoming the new Ingmar Bergman than anything else. This is though a clever and amusing product of that era and a lot of fun. No Comments on "Sidney Kugelmass, his love affair with Emma Bovery and other funny stories"